Before going to bed on the night of the Orlando shooting, I made a note to write something about the tragedy, but at the time, I didn’t know exactly what angle I planned to take. Until I woke up the next morning. God pressed on my heart the burning need to declutter apathy. It’s the worst mass shooting in U.S. history and we’re not altogether shocked. At least I’m not. These types of horrific crimes against humanity are becoming more commonplace and I feel wholly incapable of stopping them. Completely helpless. And since I don’t feel God has called me to live in a bubble of isolation, I simply go about my business, while understanding the inherent risks that are present in today’s world. When something like the shooting at Orlando’s Pulse Nightclub happens, I’m completely horrified and reminded of the evil in this world. I shake my head in utter disbelief, say a prayer or two, and then go shopping at Costco. Along with a WHOLE LOT OF OTHER PEOPLE I might add. SWAT teams and police officers risked their lives to save innocent people, rushing in when others were being told to run away. I took note of the news report, and then took a dip in the pool with my honey. I have a heart. And it hurts. But sitting around and thinking about the pain doesn’t make anything any better. To further amplify my indifference, the shooting was in a gay nightclub. Not somewhere I frequent. In fact, not somewhere I’ve ever been or ever plan to go. Not something I can relate to at all. But I do go to sporting events and shop at malls. I have grandchildren that go to preschool and a mom who works in a grocery store. We attend church. What if, God forbid, the shooting happened at one of these places? Would I be more horrified? And there’s tremendous guilt in this. Unless it affects ME, there’s a degree of apathy present. And the less relatable it is, the less empathy I can muster. Am I called to carry the pain of the world’s atrocities in my heart? Without shirking responsibility, that sure sounds like a job for Jesus. He’s a much better fit for taking on the burdens of all mankind. But I do have a part in this and I’m honored to participate, there are just times I need to be reminded how and why. How do I reconcile this? How do I find balance? How do I live the full, rich live God desires for me while lives are crumbling all around? How do I pause from my regularly scheduled life and feel deeply for others who are suffering unimaginable heartache? How do I make a difference? And Why? Why should I bother to care and try? 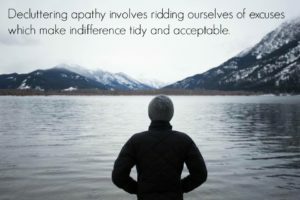 The ability to declutter apathy is born from making consistent, positive changes to everyday life, not trying to instantly conjure up fleeting feelings of care and concern when disaster strikes. I would submit that the following are things we should be doing at all times, not just during times of crisis, yet as a matter of daily practice and habit. We may need to step up our game when the situation warrants it, but having a foundation firmly planted in Christ will sustain you, and those around you, through the storms. Pray – Prayer is always the very first and most important step. Prayer draws us closer to God and opens our heart for a depth of understanding and feeling we would not otherwise experience. When not rocked by a specific tragedy, we should be praying for our country, government, leaders, first responders, etc. ; those responsible for making wise decisions on behalf of their citizens and those charged with protecting them. We should pray for other countries of the world. For strong, Godly leaders to rise up and for peace and justice to reign supreme. When catastrophe occurs, we should be even quicker to fall on our knees and more inclined to stay there awhile. There’s power in prayer and strength in surrendering to our Almighty God. He knows our hearts, but there is no replacement for talking to Him, leaning on Him, and needing Him. Focus on the Family has a spectacular post on the reasons to pray. Take a minute to check it out by clicking here. Witness – Our entire purpose on earth is to glorify God’s Kingdom. Period. During times of peace or times of war, we should continually strive to shine His light and bear witness to our Creator. Show Kindness – God doesn’t task us with being selective when showing compassion. There are no qualifiers named. Gay or straight, black or white is inconsequential. As a child of God, we are instructed to show compassion to all humanity. And to feel for everyone. Utilize Your Gifts and Talents – We’ve all been given gifts and talents. Sure, some may have more than others, but each of us has exactly what we need to get the job done and God expects us to use what He’s given us for good. Cast Fear Aside – Fear is a paralyzing defense mechanism which does no good except to alert us to danger. After that, we must forge ahead, shifting to an attitude of faith and confidence. With God on our side, whom shall we fear? If you’ve never heard Matt Redman’s song, You Never Let Go , now would be a great time to give it a listen. And even if you have, turn those speakers up! Love Others – God loves us when we are at our worst and the hardest to love, and He calls us to do the same. To be a Christian is to show love to everyone…the friend and stranger alike, deserving or not. Why should I care what happened in a gay nightclub over 2,000 miles away when I don’t agree with, nor support, the gay lifestyle. Excuse – The homosexual lifestyle is a sin, and as a Christian, I’m perfectly justified in steering clear of ‘those kinds of people’. Truth – While I do believe homosexuality is a sin, all people have sin in their lives, including me. I’m eternally grateful that sin doesn’t reduce our worth in His eyes, and it shouldn’t in my eyes either. As a Christian, I’m called to show the same love and respect to everyone, just as Christ shows love and respect to me. Doing this doesn’t indicate approval of a lifestyle, yet instead, reflects the genuine nature of my spirit to ‘love one another’ and truly mean it. Why should I care about the persecution that Christians, halfway around the world, are facing? Excuse – Eh, that’s so far away, I’ll never have anything like that to worry about. Those atrocities just don’t happen here. Truth – In today’s world, Christians are facing more hostility and scrutiny than ever before and to think that as citizens of the United States we are exempt from persecution is a grave miscalculation. As a Christian, I am called to care for my brothers and sisters in Christ, regardless of where they live, and to have empathy for their plight. Decluttering apathy involves ridding ourselves of the excuses which make indifference tidy and acceptable. Just because I can’t relate or don’t feel an immediate threat, doesn’t mean I’m exempt from acknowledging injustice and softening my heart to suffering of any kind for anyone. And doing my part. Every day. I’m still going shopping at Costco and plan to take many more dips in my pool, BUT make no mistake, I’m striving each and every day to care, and care deeply. To pray unceasingly, to offer a show of support and unity, to encourage, to initiate help, and to feel. To allow my heart to break, which is perhaps the greatest effort and sacrifice of all. It has been said that a broken heart means you’ve loved. This entry was posted in Inspirational, Self-help and tagged action, apathy, care, declutter, God, heart, help, indifference, love, Orlando, respect, shooting. Bookmark the permalink.